Especially after the wild ride that began in the fall of 2008, individual stock investing has become far more challenging. Think of a golf swing - hit it right and it goes long and straight, hit it wrong and you'll end up far off in the weeds. But - like much else in life - golf swings become habits when done right. Investing should be no different. What works should become habit, and each and every investor should develop his or her own set of habits for success. 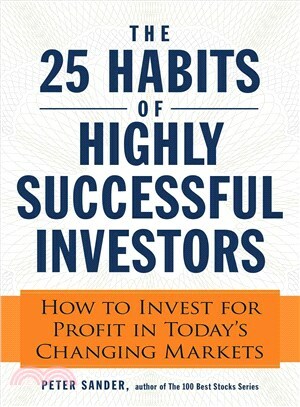 Peter Sander in this book reveals a set of twenty five habits that lie behind his own personal investing success, habits loyal to the value investing principles of Benjamin Graham, Warren Buffett and others. These 25 habits - or your own version thereof - will help you hit your investments long and straight. Peter Sander has written thirty-five books on investing, personal finance and general business topics, including the 100 Best Stocks to Buy series, Value Investing for Dummies, What Would Steve Jobs Do? and 101 Things Everyone Should Know About the Economy.